Thursday June 23, I attended my first Klout perk party. Apparently I’ve built up enough Klout by bashing Klout to deserve an invite. The event was showcasing Nudie Jeans at the store Rolo in the SOMA district of San Francisco. If you’ve ever wondering what I’d look like as a hipster, here’s a shot of me in some very tight hipster jeans. For those curious, this pair is the Slim Jim Org. Dry Dark, which can be yours for $179. Overall it was a fun event and one that may signify a move by Klout into the local space. This was the first event of its kind. After my initial Klout blog posts, I followed up with their Marketing Manager Megan Berry @meganberry and Director of Ranking Ash Rust @ashrust in a series of emails. I sent them a barrage of questions; below are their answers. Q: How Klout will deal with identical individuals across multiple networks? K: We look at each platform holistically to try and determine what the signals of influence are. We then perform sophisticated analysis to weight the different platforms appropriately for each person. Q: My Foursquare friends are a strict subset of my Facebook and Twitter friends. Will they double count? K: Follower and friend count are really not part of what we do — it is about ability to drive action. A: I thought this was a decent answer. I have a few friends that are very active on foursquare, but relatively inactive on Twitter. If my activity drives actions on both Twitter and foursquare, I should get more credit. Q: CEO Joe Fernandez stated: “Klout Score is not about followers or your activity level but about how people react to your content. ” This is a bit vauge. Now that we have more than 140 characters, can you elaborate a bit? K: Yes, we don’t believe that followers or friends are a good measure of influence. Instead we’re looking at the engagement you get from people (i.e. RTs, @msgs, likes, etc.) and how influential those people are. A: I agree that followers/friends should be secondary to actions indicating that individuals are actively engaged with your content (i.e. RTs, @msgs, likes, etc.). I also agree that a Robert Scoble or Michael Arrington RT or @ reply should be worth far more than my mom RTing something I say. Q: Why do you feel you are better than competitors such as Peerindex and twittergrader? K: We are the emerging standard in this industry — we are used by over 2000 applications and major brands to understand and measure online influence. A: Worst answer ever, even worse than your parents saying “because I said so.” I more or less agree with their assessment that they are the emerging industry standard, however, would they still be if they didn’t get a 1 year jump start over all other competitors? What if PeerIndex’s infrastructure were more scalable and could handle the same scale as Klout? I expected some statement assessing their relative quality in terms of ranking or infrastructure, not a catch 22 or tautological response. Q: I think the new K+ system is awesome, but am worried about spam. What steps are you taking to ameliorate the risk? K: We’re watching this very carefully to understand how people are using it. We also limit people to 5 +K’s a day. His current Klout topics (which still include unicorns) are available here. It also seems like Klout slightly changed their shade of orange from the pics above. On a more serious note, I think the K+ system is an incredibly important step in the evolution of Klout. The next step is to provide topic specific scores. Using these they can start to tackle the holy grail of influence measures: individualized influence scores. A serious problem with existing Klout scores is that it removes individual context from the equation. Justin Bieber will forever have a Klout of 0 for me, even though his systemwide Klout is 100. It would be easy to check that Justin Bieber has no Klout for the topics I am interested in (apps, startups, statistics, mongodb, etc.) This approach is much more computationally expensive and harder to get right. Tweets, Facebook posts, etc. are not labeled with topics, so these must be inferred. This is a VERY difficult problem due to the small amount of text. I’m sure Klout and PeerIndex are both working very hard to tackle the problem. Whoever gets that right will take the “influence” market. What % of Klout systemwide is attributed to Twitter v Facebook? Will adding another network ALWAYS increase your score? If not always, empirically, what % of the time does an increase occur? 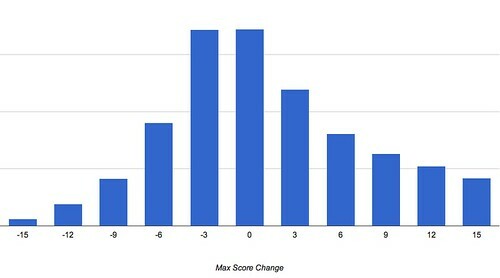 In a recent Kloutchat, the statement was made: “Nearly 50 variables in generating klout score but it all boils down to how people react to your content” Whats the most interesting/surprising variable that you are willing to divulge. It’s not surprising that Megan and Ash did not answer all of my questions. I think the answer to the first question is roughly 85/15, but they won’t say that publicly because a) it might piss of Facebook if they think they are “underweighted” b) they don’t want people outside the company arguing about how this should be weighted. Im sure they have had tons of discussions about this internally. For the second question, the answer is yes, until Klout tells us otherwise. I won’t go on a rant about the silliness of this, however, if you want to boost your score, attach your FB account. I’ll do a longer “Klout SEO” post in a few weeks. I sent PeerIndex CEO Azeem Azhar the same group of questions, and will post his responses when I hear back. Next post, I’ll answer the question: “If you were creating my own Klout/PeerIndex/Twittergrader competitor, what signals would you use?” I bet I can come up with a set of 50 variables very close to those used by Klout. Seems like I struck a nerve with my earlier post about Klout. Binh Tran, the CTO of Klout, Megan Berry, marketing manager at Klout, and Klout itself are all now following me on Twitter. In addition, I received a lengthy response from Ash Rust, the Director of Ranking at Klout, which I have included in full at the end of the post. I appreciate Ash’s candid response. On the first point, he’s right. It’s unrealistic for me or anyone to expect perfection of Klout or any of the competing metrics/companies, especially at this relatively early stage of Klout. Think about Google 2 years afters its launched and how far its come since then. Still, companies need to know what users find wrong with their products to iterate and improve. I didn’t receive hundreds of RTs because my writing was so exceptional or witty; I received them because I articulated a set of issues seen by others in Klout. Ash’s second and third points seem to contradict each other. Categorically stating that adding another network will always increase your score, seems to be a victory for quantity, not quality. In the Klout Chat yesterday, CEO Joe Fernandez announced that Foursquare and LinkedIn will soon be added. Without the proper Twitter/Facebook balance in the current system, I worry that adding two additional networks to the mix, will exacerbate existing issues. Additionally, I wonder how Klout will deal with identical individuals across multiple networks. My Foursquare friends are a strict subset of my Facebook and Twitter friends. Do they double count? Should I get any credit at all for adding friends already accounted for elsewhere in the system? As I have time over the next few days, I’ll gather a few unanswered questions from the #Kloutchat in addition to others I have. I’ll send Ash a list that they will hopefully answer. Let me know if you have a few to add to the list. I’m the Director of Ranking here at Klout and wanted to respond directly to some of the points you raised here. 1) Thanks a lot for writing this. It’s great feedback on the understandability of our score and mirrors a lot of the (intense) debates we have internally around how the score works and what data to deliver to our users. 2) Klout is just beginning. We believe we’re at the very first stage of development for this paradigm, much like online document search was in 1998 when Google was founded, so we can expect some growing pains especially given the volume of data we process. That said, we know we need to do better and we’re working hard to improve, we have a team of excellent scientists working on improving the score. 3) Your Klout score is about quality not quantity. While some users may have amassed many thousands of friends and followers, those people may not be listening or may not even be real people at all; this is why we use our own audience metric: True Reach. We also assess the influence of each person in your audience, so if someone you interact with is very influential that can have a much larger impact on your score than a group of people with lower levels of influence; for example if @BarackObama retweets you, it’ll increase your score more than if I do. 4) Adding additional networks to your Klout should increase your score. We can only measure the data we have. If you add a network, like Facebook, and are influencing people on that network, then it should increase your score; assuming you’re influencing people on that network. If I influence 10 people on Facebook and then add my Twitter account, where I influence 3 people, Klout can now see me influencing 13 people, hence the score increase. I hope this answers some of your questions and please feel free to follow up with me directly. As a Ph D Statistician and search quality engineer, I know a lot about how to properly measure things. In the past few months I’ve become an active Twitter user and very interested in measuring the influence of individuals. Klout provides a way to measure influence on Twitter using a score also called Klout. The range is 0 to 100. Light users score below 20, regular users around 30, and celebrities start around 75. Naturally, I was intrigued by the Klout measurement, but a careful analysis led to some serious issues with the score. The four groups were chosen to span the Klout range and contain bloggers, executives, tech pundits, and celebrities of varying levels of activity in social media, notoriety, influence, importance, etc. Let’s consider a few pairwise comparisons. First, Ben’s stats dominate mine excepting likes per post and comments per post, however, his Klout score is 7 points lower than mine. Next, Binh’s stats completely dominate my own in EVERY category, often by very large factors, yet we have identical Klout scores. Carla’s scores also completely dominate mine, but her score is lower. Finally, consider Chomp and Vic Gundotra. Vic’s stats blow Chomp out of the water, yet his Klout score is lower. In the “real world” sense of the word clout, Vic should dominate this group. The group 1 comparisons demonstrate the Klout score violating rules 1 and 3 from above. In group 2, my roommate has a higher Klout score than Paul Graham? Really? By 5 points? Paul has 6x more followers, 2x total RTs, and 4x as many unique RTs, but he hasn’t linked his FB account. Adria has incredibly low FB stats (she uses it sparingly), but apparently that still gives her a tremendous boost. Adding a FB account is far too easy a way to game your score higher. I understand that Klout wants to incentivize the attachment of FB accounts and keep growing virally, but this aspect of the Klout score seems broken. Additionally, the pairwise comparison of Y Combinator and Paul is confusing. Paul’s stats are much higher, but they are assigned the same score. One could argue different, perhaps more Klout-tastic people, are following Y Combinator, however, I find that unlikely given that Paul is in charge of it. Finally, its wrong that Adventure Girl’s Klout is so low. She has been named one of the top 100 people on Twitter, has been featured in Time magazine, etc., but her Klout is only two points higher than Adria’s. Things get very confusing in this group. Jack Dorsey’s stats dominate those of David Pogue, but his score is 4 points lower. Matt Cutts has 4000 more total RTs but 1.5M fewer followers relative to Jack Dorsey, so his Klout score is 1 point higher? I’ll go out on a limb and state that 4000 incrementral RTs seem FAR less valuable than 1.5M incremental followers. Klout, the company, has fewer followers, total RTs and unique RTers by a factor of at least 6, but 7K more unique mentioners, so Klout’s Klout score is 4 points higher than Jacks? But if unique mentions are so valuable, how can Jack Dorsey have a lower score than Matt Cutts when he has 16K additional unique mentioners? This is just the start of the inconsistencies. Without FB, MG Siegler’s score would likely be 10 points lower. Jeffrey Zeldman’s blog is super high quality, but does he deserve to have more Klout than David Pogue? Again, Facebook puts him over the top. I think that Klout’s score is far too high, though perhaps its not surprising Klout does well on its own metric. Finally, I included Tim Ferriss not just because I’m a huge fan, but his stats provide an interesting counterpoint for even more interesting pairwise comparisons. It will lead you to several more contradictions concerning the relative value of followers, RTs, unique RTers, and unique mentioners. The pairings of Scoble/Hilton and Sheen/Kawasaki again demonstrate the severe miscalibration regarding Facebook scores. Also, I’m not sure I trust any system which has Justin Bieber as most influential. Connecting an additional account (ie Facebook) will ALWAYS increase your Klout. The differential between number of people you follow seems to be irrelevant or matter very little. To be fair, Klout does not want their score to be completely transparent. Then it would be easy to rip off and even easier to game. That being said it should be possible respect the three conditions I enumerated and still keep a lid on their secret sauce. As I have time, I’m going to mess around with the Klout API a bit and gather more comprehensive data to further demonstrate the points made in this post, including a similar study concerning the Klout of companies/brands. Additionally, I will submit several questions regarding my analysis to Joe Fernandez’s (the CEO of Klout) Klout chat, and hope the company follows up. I’ll post any details/answers I receive here. More info about Klout can be found in Techcrunch articles about their initial launch, series A funding, series B funding, addition of Facebook to their ranking, and their crunchbase profile. As any good statistician should, I need to qualify my analysis. There is of course selection bias in the examples enumerated above. Although not as egregious, these head scratching scores are the rule, not the exception. All data was pulled on 5/29/11, and may not reflect current scores. Finally, please remember that this is my personal blog and reflects my opinion alone. In particular, it does not reflect the opinions of any employer past, present, or future.